So, you want to join in the website but you don't know how to use it? This is your user control panel. There is a lot of choices you can do with this. Theres Home, Calendar, FAQ, Search, Members, Groups, Profile and Private Messages... There are some few things you can do. Home, is your home button. Calendar is the website's calendar, you can see future updates and events in this tab; birthdays and world meetings but don't be shy. Whenever you want something up there. Feel free to contact any Admin to put it up in the Calendar. FAQ is a system created yours truly by the Forumotion company, where your questions that cannot be answered by the Head Admin can be answered here. Like if something is going on with you account. Members. This tab will show you the list of members that are registered in the site. This is also your way of seeing how many friends you could get! Groups. This is like the Member tab but this is a little bit different. Instead of mixed of friends, this is separated by 'groups' we have a total of 4 groups. Admin, Mods, Canon characters and members which is basically everyone. Every registered member can be a canon character and a member. Profile. This tab is important for you and for your use. In here, you can edit everything about your profile. Avatar, Friends, Infos and Signatures.... Try to explore it! What happen if you clicked that? Looks like I have a message from Mio Fratello, Lovino! Take notice. If you look at the left of the title, there is a yellow circle flashing. In this site, anything an icon or a circle or even a title font is yellow. It means, you haven't checked it or just simply new. This goes the same for the Website. This icon is not only for a show but whenever there is a new post. This will flash yellow and there will be a new note with it saying "New Post!" How can I private message? How can I reply to my private message? Remember the message mio fratello sent? I clicked it open and his message should come up! I would look at the message and gaze at the upper right corner. I saw "Add Reply". I shall click it and this should come up. Excuse my little drawing and arrow. I drew this with a trackpad! There is /1/ pointing at the full of little icons and something is telling me that I should take advantage of that. Those are called "BBCodes" Using them will make your reply a little more lively. In here, you will be able to put a lot of things. Bold your letters. Italicize your letters, underline them, color them, and many more! /2/ is where you put your message and BBCodes. How to use these BBCodes... Simply just highlight your desired letters with your cursor and press whatever BBCode you wanted to be placed. NOTICE, I also marked a blue dot near below the picture and beside "Preview" When you use a BBCode, I highly recommend you to use the Preview button. The Preview Button will show you what and how your message will look like before it sends to the other user you wish to send it to. Hit "Send" when you are finally feeling comfortable with your message or reply. Now, How can I private message other users? There is a lot of ways to do this, however I am giving you just a few instructions... Well how I learned mine. I'm going to give you 2 ways to do so. 1 is when you go to a persons wall and 2 is when you go to your private message catalog. 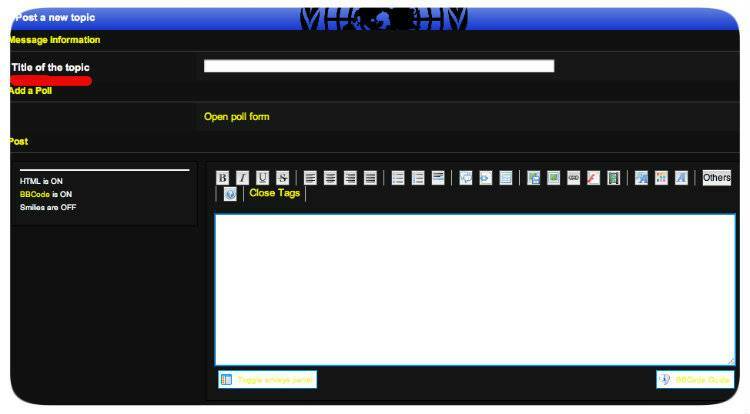 In this method you will go to a users wall by clicking on their username. The website will directly put you there. It should look something like this. I went to one of my friend's page and it directly placed me into his page or wall. It should look something like this. Looks like Mr. Kirkland has a lot of ways of messaging him. 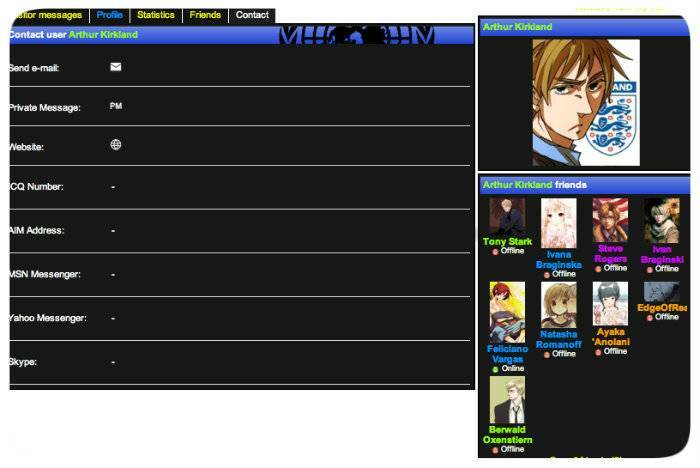 If you only wanted to message via Hetalia International, I would choose "Private Message" With that it will bring you to your messaging page. And everything should be good from there. In this method, you will start from your Private messaging Catalog. Click "Private Message" in your catalog. I would click "New PM"
It should bring you into your messaging board. Note that there are 3 choices you can perform a private message. 2nd choice is when that user is added as your friend. Clicking that choice will list down all your friends and you can choose whoever you should send a message. The 3rd choice is more likely a group messaging. This one is very helpful if you and your friends are role playing via PMs. If the 2 choices aren't appealing for you, you'll have to go with the "Find a Username" route. If you know the person's full username, you can just type it out. If not, you'll have to click the button only to make sure that your message will be sent to him/her. Some users here change their usernames VERY OFTEN so watch out. Here's an example of the 1st choice. Choose your desire user and it'll give you a list of users. Hit "Select" and continue on with your message. How can I post a reply and participate in a role playing? Just like before role playing, you must learn how to role play and be in character. Same as this, you must know how to post before you could participate in a role playing or at least post something. Since you are new, maybe teaching you how to post in the 'Introduction' section can help you learn how to post message within the forum! Go to your 'Home' page. Click "Introduction" it should send you inside. I would look at the upper right corner again and would click "New Topic"
It should come up like this. That's right. It just looks like your private messaging board. Only a little bit different when it comes to Title's. If its your OWN topic. A title is necessary. If you're only replying to someone's topic, a tittle wouldn't be necessary. This post will be public which every member could see. 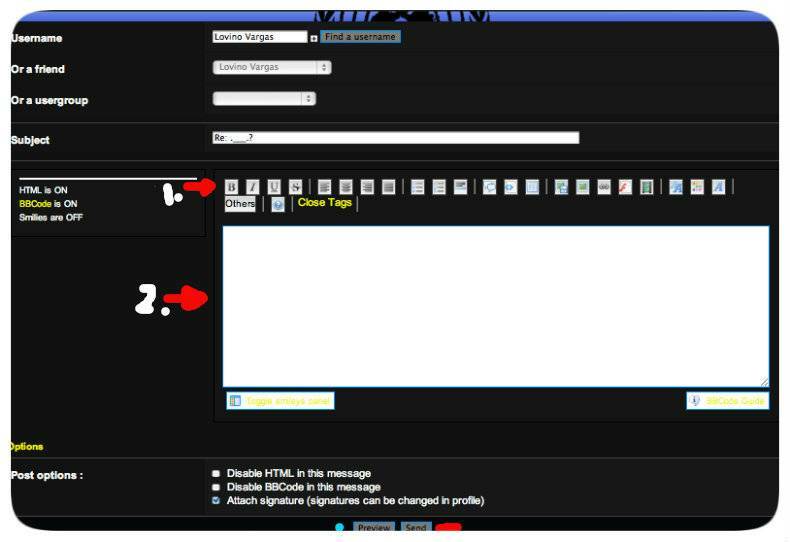 If you are using BBCodes, underneath your message there will be "Preview" and "Send" Buttons. Take advantage of the "Preview" button. It will show your message how would it look like before it will be posted. Where are the rules and character information located? 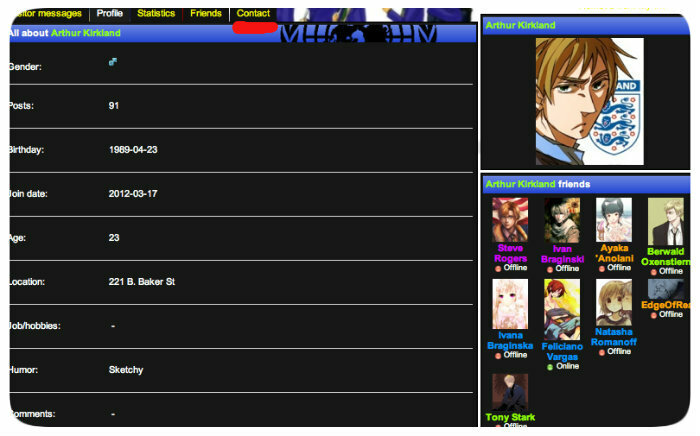 The Rules are located under "Rules and Character Instructions" at the 'Home' page of Hetalia international. Its best to know the rules and how to sign, and register your character. Click "Rules and Character instructions"
Read; Website Rules, Original or Canon Applications (depends what kind of a character you are trying to apply for), and Canon character list (If you are trying to apply for a Canon. An original character is when a character is... Originally made by you and not by anybody else. However, since this is Hetalia, there are a lot of countries haven't yet personified but, they have historical facts. It's recommended you do a little research of the character you are applying for. For Example; America's State, Texas... I can't put Texas as a depressing character because Texas is known as 'Mini-America' He is supposed to be wild, outgoing, carefree, strong, and a cowboy. Original Character submissions is the place you should put your Original Character Application. That section is located in the 'Home' page. Within that section, I put up a list, a list of original characters already taken so, nothing would be repeated. Unlike Original Characters, Canon Character application is sent and approved via PMs to the Admins, you can send it to any admin. We're going to read it through and will give our approval. We recommend you to put your time into your application. If so, ask away! PM me!